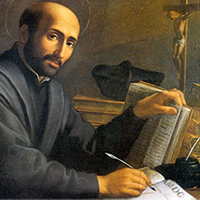 The Feast Day of St Ignatius Loyola is celebrated on 31st July. 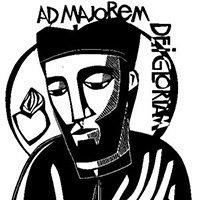 Jesuit schools in the UK celebrate the feast on a suitable day at the end of the summer term. For most schools this will be their final and thanksgiving Mass of the school year. 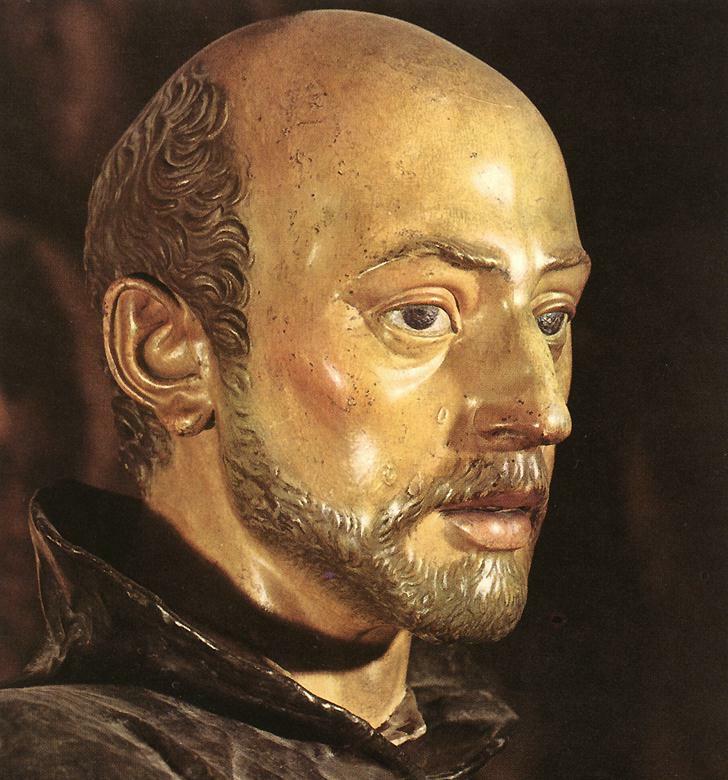 In Jesuit churches and schools the feast of St Ignatius is celebrated as a Solemnity. 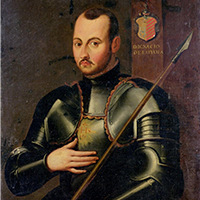 Ignatius Loyola , born (1491) of a Basque noble family; chose a life of chivalry and sought fame until he was wounded at the battle of Pamplona (1521); during long convalescence he underwent a spiritual conversion; lived as a hermit at Manresa where he began to see how God was active in his life; his notes from this time became the Spiritual Exercises; with companions he founded the Society of Jesus (1540); Ignatius spent the rest of his life developing and governing this new order. 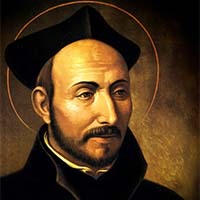 Died 31st July 1556 at Rome. 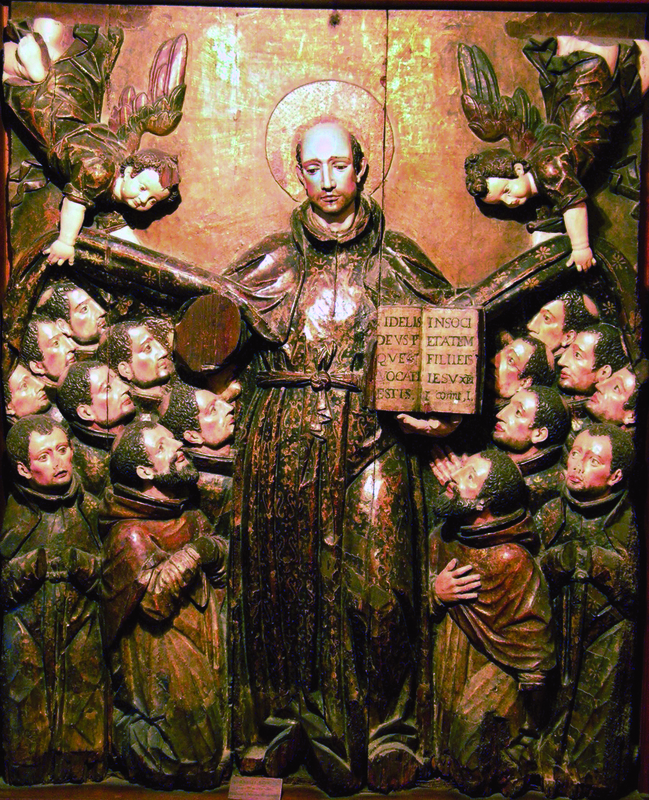 Ignatius born, the youngest of 13 children, at Loyola in the Basque country of northern Spain. 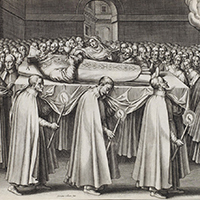 Enters the service of the King's Treasurer as a page, at Avila. Appointed Gentleman-in-Waiting to the Duke of Nájera, Viceroy of Navarra. Battle of Pamplona, 20th May. 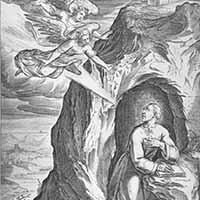 Ignatius falls wounded. Taken home to Loyola to recover. Reads The Life of Christ and the Golden Legend. Begins to practice the discernment of spirits and chooses a new life. Leaves Loyola (February). Pilgrimage to the shrine of Our Lady at Aránzazu. Spends the night in vigil before the Black Madonna at the monastery of Montserrat. 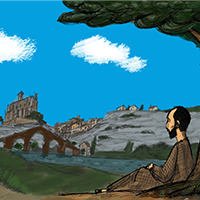 Travels on to Manresa in search of Paul, a hermit with expertise on pilgrimage to the Holy Land. Spends 11 months at Manresa in prayer. 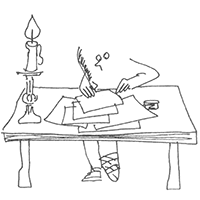 Begins to make the notes which will become the Spiritual Exercises. 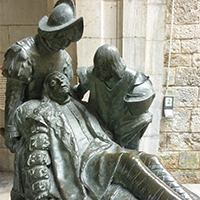 18th February - leaves Barcelona for the Holy Land. Arrives in Rome on Palm Sunday. 4th September - enters Jerusalem. 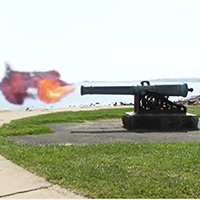 Ejected from the Holy Land by Franciscan guardians. Returns to Barcelona. 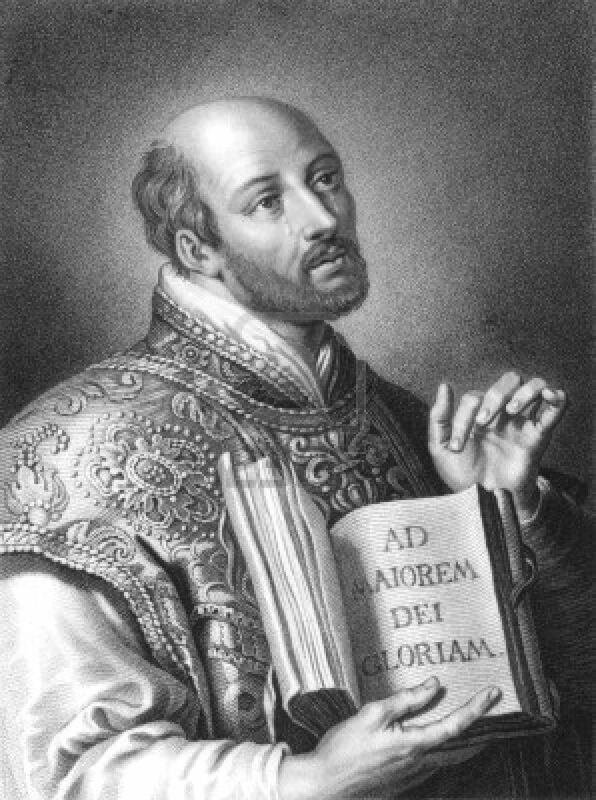 Begins to learn Latin before pursuing higher studies in order to 'help sous' without interference from the ecclesiastical authorities. Enters the university of Alcalá, near Madrid. Arrested and imprisoned for teaching the Christian faith without authorization (this happened eight times in all over the next few years). July - enters the university of Salamanca. Enters the university of Paris. Lodges with Pierre Favre and Francis Xavier, his first companions. Journies to London to beg alms to support himself in his studies. 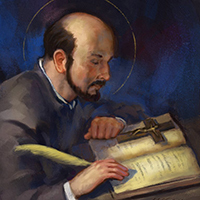 Ignatius and six companions take a vow of poverty, decide to go to Jerusalem, and to spend their lives as 'friends in the Lord' helping souls. 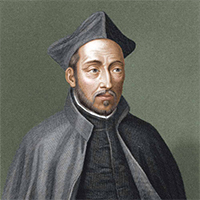 Ignatius grduates as a Master of the university of Paris. Visits his family at Loyola for the last time. The companions reach Venice en route to Jerusalem. 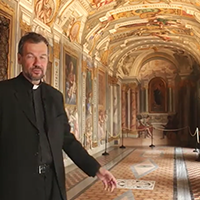 They go to Rome to obtain the Pope's blessing but he encourage them to 'help souls' in Italy. 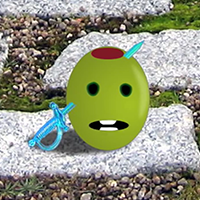 The companions disperse to various towns in Italy. 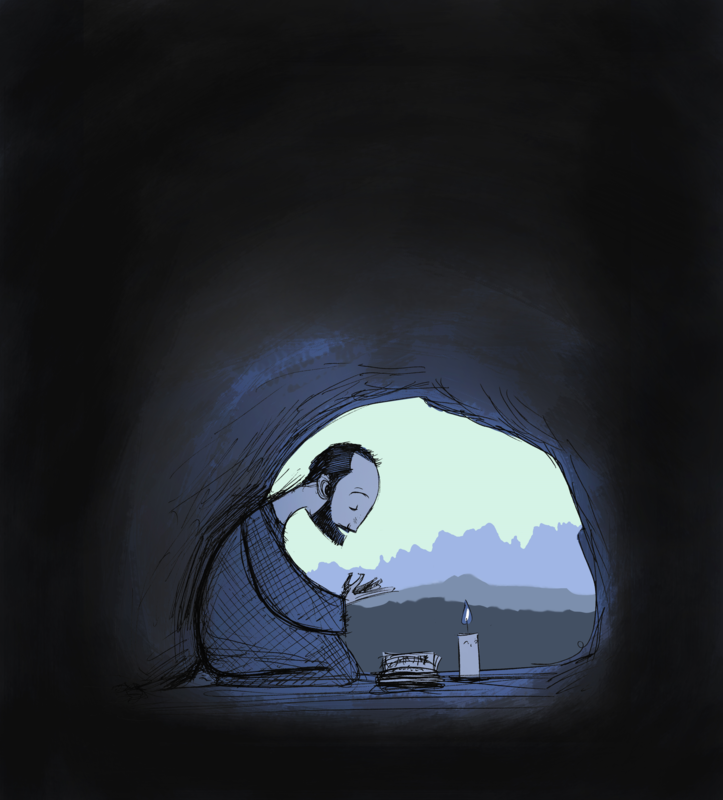 Ignatius has a mystical experience at La Storta, outside Rome. 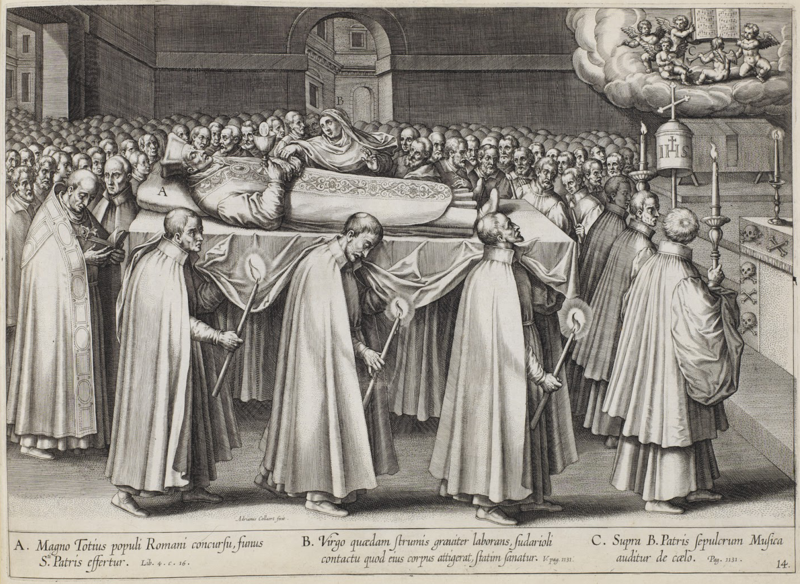 The companions put themselves at the service of the Pope and the Church. 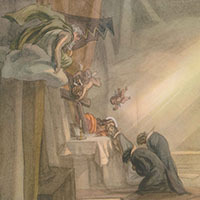 The Deliberation of the First Fathers - the companions decide to bind themselves in a new religious order of priests to be called the Society of Jesus. 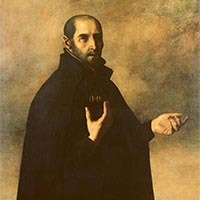 Francis Xavier set out for the far east. 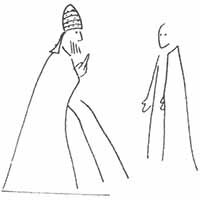 27th September - Pope Pal III approves the new Order. 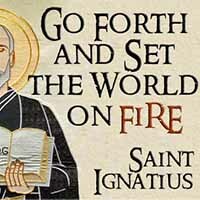 Much againsthis will, Ignatius is elected the fist Superior General of the the Society of Jesus. 22ndApril - the first 10 companions take vows of poverty, chastity and obedience at the basilica of St-Paul-Outside-the-Walls, Rome. 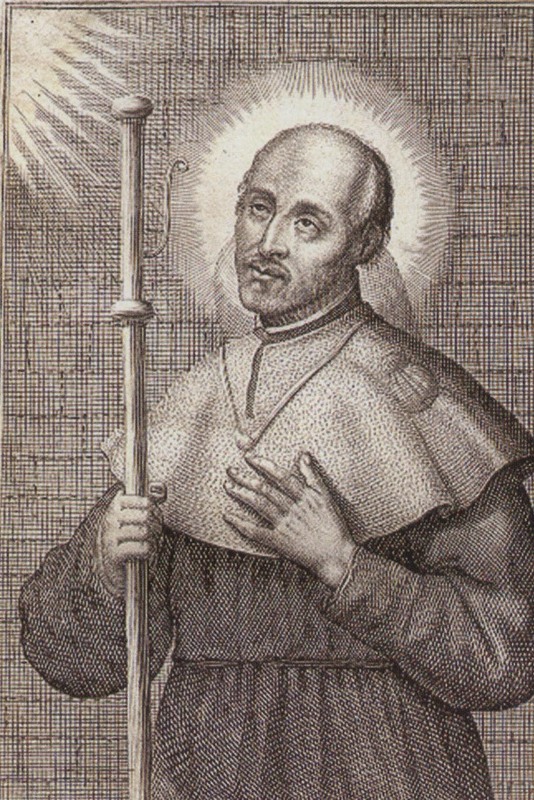 Laínez and Salmerón are sent as expert theologians to the Council of Trent. 1st August - Pierre Favre, Ignatius' first companion, dies in Rome. 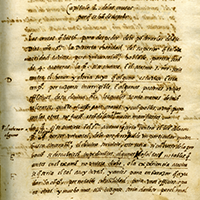 The Spiritual Exericses are approved and published for the first time (in Latin). 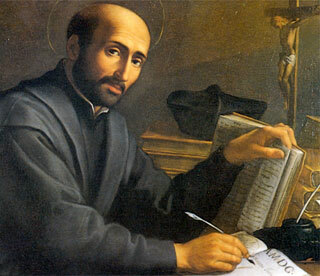 Ignatius finishes the first draft of the Constitutions for the new Society. 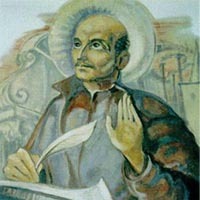 Francis Xavier dies on Sanchuan island, off the coast of China. 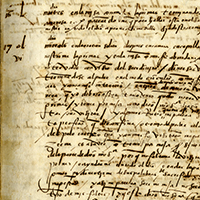 Ignatius dictates his Autobiography to Luís Gonçalves da Cámara. 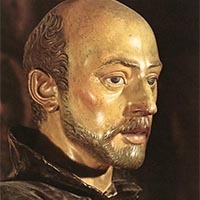 31st July - Ignatius dies in Rome. There are already over 1,000 members of the Society of Jesus in many parts of the world. 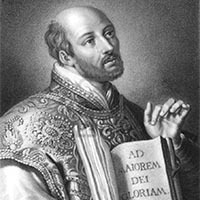 Ignatius is declared a saint by Pope Gregory XV. 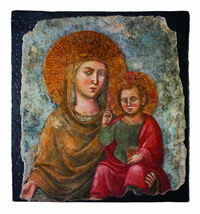 Image © 2011 Simon Norton Museum, Passadena; used with permission. Image © 2013 William Hart McNichols; used with permission. Image © 1991 Cova de Sant Ignasi de Manresa; used with permission. 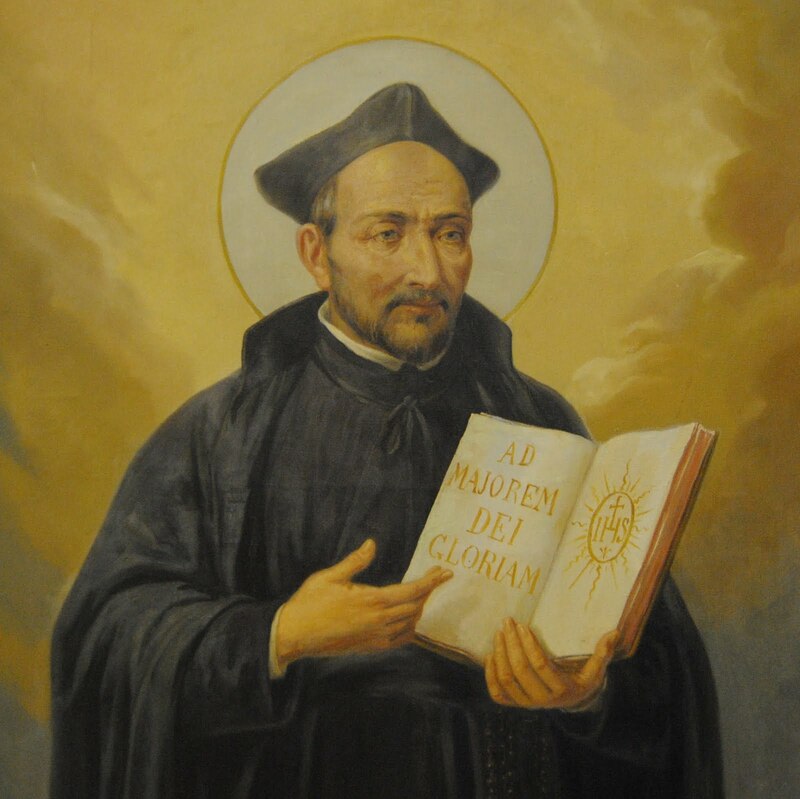 A short biography of St Ignatius and an introduction to some of the key features of his spirituality. 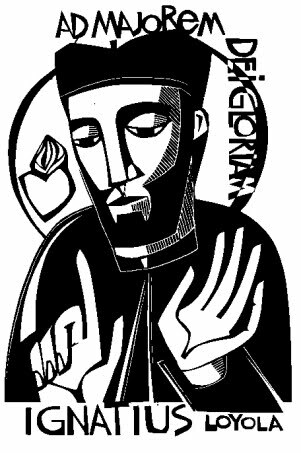 Lord, teach me to be generous; to give and not to count the cost. 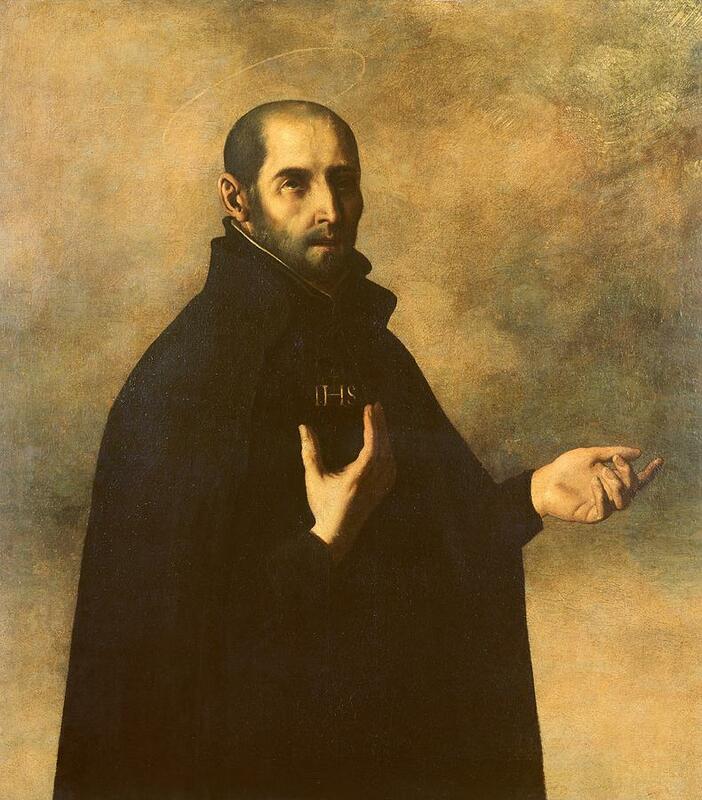 Who better than a Spanish olive to tell the story of St Ignatius Loyola, founder of the Society of Jesus, and probably the most famed Spanish Basque of all time! This Monty Python-esque video gives the historical details of his life in a uniquely humorous way. Written and edited by Jason Kapell. Fairfield University Media Center. 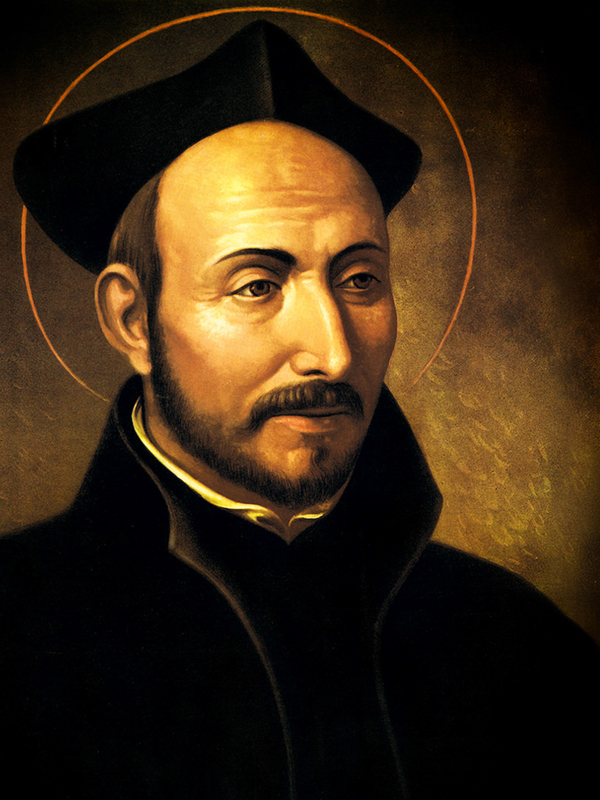 Think you know St. Ignatius? 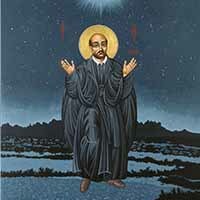 Ignatius Rap takes a unique look at the life of St Ignatius and how he became the founder of the Jesuits. A wonderful set of vibrant illustrations of the life of St Ignatius by Ignasi Flores. 4b Discerning the future - riches or poverty? 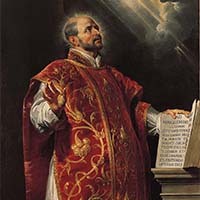 in the Rooms of St Ignatius at the Collegio Internazionale del Gesù, Rome. 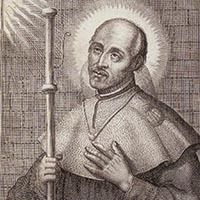 This painting was completed around the time of the beatification of Ignatius in 1609.
in the General Curia of the Society of Jesus, Rome. 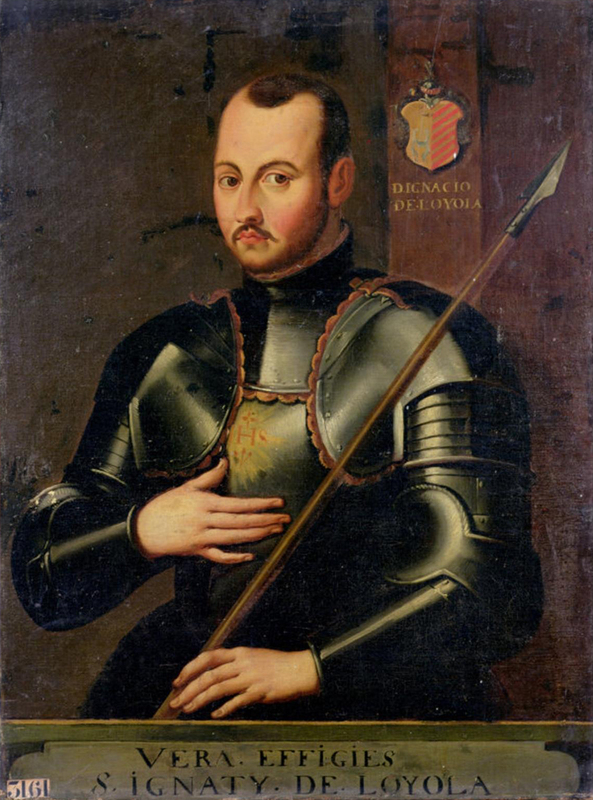 This portrait was completed shortly after Ignatius' death in 1556. Del Conte used the death mask as his model. 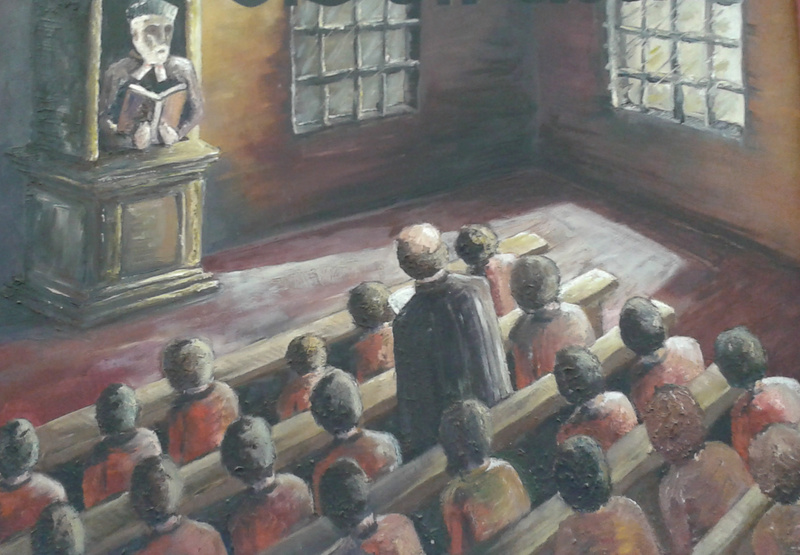 Mural in St Peter's Church, Stonyhurst, England. 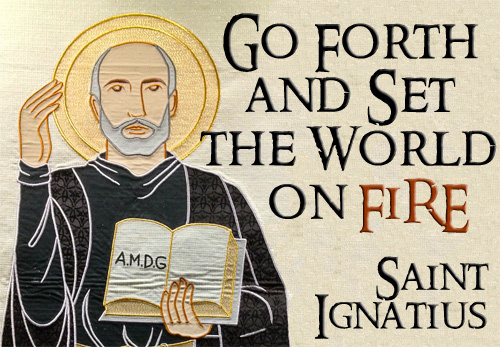 These words are ascribed to St Ignatius as he sent St Francis Xavier on mission to the east. 24 Go set the world on fire! 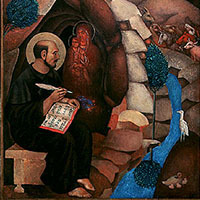 This was the mural before which Ignatius prayed at the church of Our Lady of the Way in Rome. It is now in the Church of the Gesù, Rome. 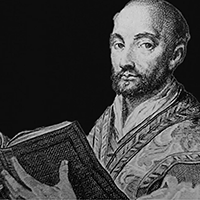 St Ignatius dictated his autobiography to a member of his community in Rome in the last year of his life. 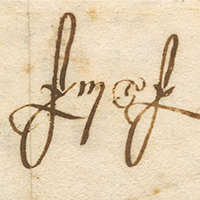 The autobiography provides an accessible insight into the life and conversion of The Pilgrim and into the beginnings of the Society he founded. 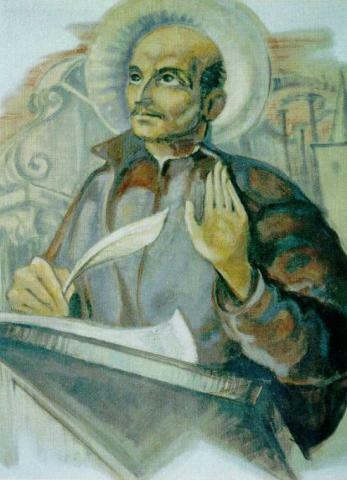 St Ignatius began writing the notes that would become the Spiritual Exercises during his convalescence at Loyola in 1521. Many exercises were added at Manresa in 1522/3 and then reworked over the next years until a definitive Latin edition was published in 1548 (illustration). 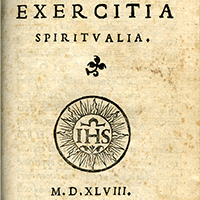 There are many English translations of the Spiritual Exercises. 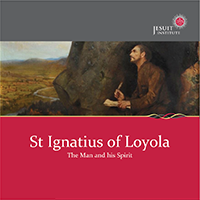 Probably the most commonly used authoritative edition is by George Ganss SJ. 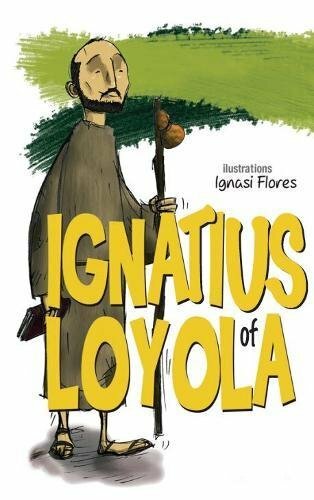 Ignatius of Loyola book by Pedro Rodriguez-Ponga SJ, illustrated by Ignasi Flores. 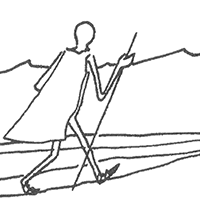 Illustrations from this book are available online - see above. 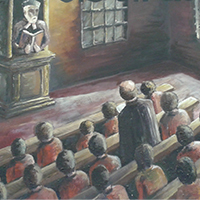 A cartoon life of St Ignatius suitable for upper primary and lower secondary pupils. Please contact the Jesuit Institute for more information.